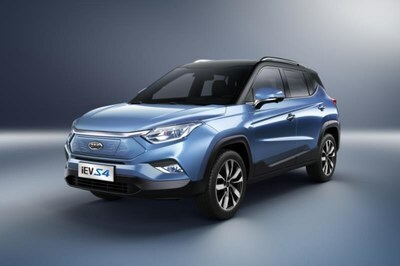 SHANGHAI, April 23, 2019 /PRNewswire/ — JAC Motors (Anhui Jianghuai Automobile Group Corp., Ltd.), one of China’s leading auto-makers debuted a new, greener line-up of vehicles and four new engines to audiences at the Shanghai Auto Show this week. Taking the lead was the iEVS4 long-distance, high-endurance EV (electric vehicle), co-developed with Volkswagen, which comes networked for more significant human-vehicle interaction. The iEVS4, with a maximum battery life of 1 million kilometers, a driving range of 470km and a maximum cruising range of up to 600km – the equivalent of up to 14 marathons – sets a new value benchmark for the pure SUV market. After three years and 1,700 simulated thermal tests, JAC has made the breakthrough to prevent the battery pack from exploding or catching fire. Combined with the new generation liquid cooling circuit, iEVS4 has prevented the battery risks. The iEVS4 is the first in the JAC range to come fully-networked with the company’s latest 3.0 connectivity software, which allows greater human-vehicle interaction. The car’s traditional functions such as navigation, air conditioning, music, search, and emergency rescue are all voice controlled, while the addition of a smart-trip booking function makes traveling more exciting. The launch of the iEVS4 and announcement of a further five models in the EV range further demonstrates JAC’s commitment to green mobility. To date, JAC Motors’ new energy passenger vehicles have accounted for 85% of total sales in the private sector. In 2018, sales of JAC pure electric passenger vehicles reached 63,671 units, up 125.28% year-on-year. JAC Motors plans to extend their range of green energy vehicles further to include a new generation A00 pure electric vehicle and the launch five new iEV models by 2021. The sale of new energy vehicles is expected to account for 20% of total sales volume by 2020 and 30% by 2025.